Paperbacks are in for Chivalry is Dead at Amazon.com! Chivalry is Dead now available at the Amazon.com kindle store! May December Publication's Chivalry is Dead is now available at Amazon.com's kindle store [click here]. 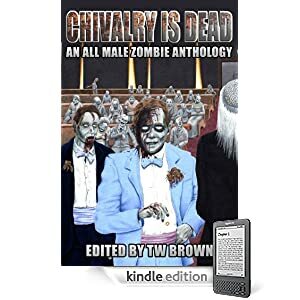 This zombie themed anthology features 13 short stories, including my contribution, "Last Supper." Nice to see my name listed as one of the contributing authors at the top of the masthead! I've recently been extended an offer to join Dark Moon Books / Dark Moon Digest as an editor! I'm very excited about this opportunity--in addition to getting access to LOTS of new short horror fiction from the next generation of aspiring horror genre writers, I look forward to the opportunity to sharpen my editing skills and provide feedback to help these author's take their stories to the next level. Click here to check out Dark Moon Books / Dark Moon Digest. Welcome to my website! I plan to utilize this site to outline my platform of work, and to connect with any fans that might be lurking out there. Visit this blog often, as I'll be providing news and updates about ongoing projects and coming attractions. Guests are encouraged to provide feedback on his stories [accessible via the publication history section of the website] and contribute to blog discussions.